"Heaven can wait 'til another day. Cause there ain't no reason to leave. The world is a stage where we all can play. Another fine reason to live and heaven can wait". It's been 25 years since you first heard the call and lead single off Heading For Tomorrow. Classic, catchy, power metal if ever. 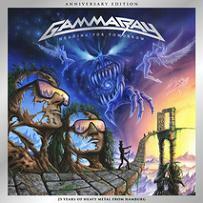 Kai Hansen formed Gamma Ray with ex. Tyran Pace vocalist Ralf Scheepers (now at Primal Fear) after leaving Helloween (at their very peak) in 1988. In fact. Scheepers was thought of as lead vocalist of Helloween. The band asked him round about the time of Walls Of Jericho to join them, but Ralf declined the offer as he didn't enjoy their full-force speed/thrash metal at the time. Originally released in 1990 (February 21), the double set Anniversary Edition includes all ten tracks (remastered), plus all B-sides and Japan tracks from the album: "Mr Outlaw", "Sail On", "Lonesome Stranger" (disc: 1). Add to this 12 extensive bonus tracks on disc 2 such as live in Japan 1990 versions of "Heading For Tomorrow" and "Space Eater". Demo versions with Kai Hansen on lead vocals of "Money", "Sail On", "The Silence", "Heaven Can Wait". Not entirely sure about the Karaoke and instrumental versions though? Simply mute the vocal track(s)?? Hansen lived in a tiny flat in Hamburg at the time and practically slept on his 24-track recorder. He sound proofed the room and was able to do all pre-production work. He wrote most of the material for the release with the exception of "Free Time" (the Tyran Pace leftover) and the Uriah Heep cover of "Look At Yourself". The first one a proper Power/Glam anthem (if there is such a thing?) while the latter doesn't fit the Gamma-concept and should not have been included in my humble opinion. Occasionally Ralf's voice slips into quirkiness (The Silence), but it's such a superb epic power/pomp ballad that you won't mind the strange vocal lines. Extensive liner notes, all the lyric, and just the classy Anniversary release of the first of many fine Gamma Ray albums. This is actually one of their weakest efforts and it's still must have in your collection. "We are heading for tomorrow. But we don't know if we are near. Will we beg steal or borrow? Will we ever lose the fear? ".